Britain's massive (two-day) heatwave might have been and gone for another year, but with warmer weather lingering on (fingers crossed) for the next couple of months, staying cool and comfortable on the bike is still an issue. There are plenty of lightweight jerseys out there that make a fine job of this, but when it comes to riding around town there's a call for something a little more 'everyday' to meet the mark. Huez* has the answer in its Dri-Wink T.
For those unfamiliar with the brand, Huez* is a London-based outfit specialising in stylish urban apparel that, in the company's own words, ''make the city commute a more friendly experience''. Huez* is a name that's becoming pretty familiar to us here at road.cc Towers. We've reviewed a handful of its products over the last year (find them here), and the kit certainly meets the mark in blending fashion and performance. The Dri-Wink T is simple, stylish T-shirt aimed at the the 'stylish commuter' market, allowing a seamless transition from bike to desk without the hassle of getting changed, but with the benefit of technical fabric. 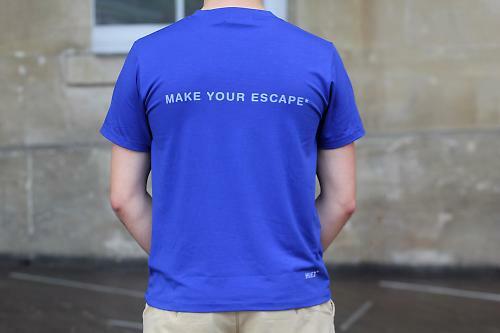 The tee has the Huez* signature typographic 'wink' design screen printed on the front and the 'Make Your Escape*' slogan across the back. It's branding of sorts but in a subtle way, not like having the company name emblazoned across the chest. 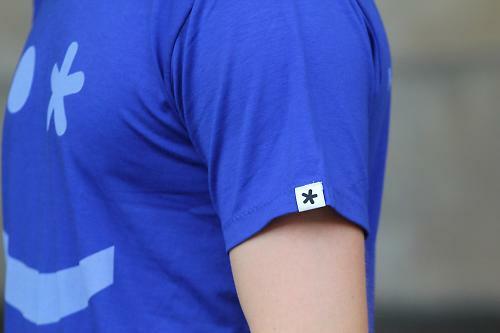 The left sleeve has a small contrasting tab featuring the Huez* asterisk, and the brand name is subtly screen printed at the bottom corner of the back. The sleeves, hem and neck are all finished with the Huez* zig-zag stitching, which it uses across a number of its garments. Not really something that's particularly noticeable to the passer-by, but a nice attention to detail nonetheless. The tee has a relaxed fit, cut so there's plenty of room to move on the bike but not so loose that it's flapping about as you ride. The hem comes down just low enough that it doesn't ride up as you reach forward, and the sleeves and neck are relaxed enough that you're not restricted at all. Off the bike it's just a T-shirt. None of the technical aspects are visible so you can slip off the bike and into the office, or the pub, without looking like you've arrived in your cycling kit. The Dri-Wink T is mainly constructed of polyester (85%) and cotton (15%), with a bit of elastane (5%) thrown in for that useful bit of stretch. The main technical aspect of the material is the dri-release technology. The dri-release fabric does a great job of wicking away moisture from the body, particularly useful on some of the stickier summer rides to the office. It also dries quickly, handy for sweat patches caused by a rucksack on your back, or if you're caught in a sudden rain shower, and also helping to keep the fabric staying fresh for longer than an ordinary cotton tee. Another benefit of dri-release is that it's permanent; it's woven into the yarn so won't degrade with washing, unlike some chemical treatments. It really did do a great job of wicking away sweat during the hottest of days. It's also really comfortable against the skin and has a real quality look and feel to it. The tee hasn't visibly degraded whatsoever after seven or eight washes. The Dri-Wink T comes in two colours: Lazulite (blue), which I've been testing, or Ecru (white). It's available in sizes that range from Small to XXL – that's chest sizes of 36 to 44 inches. Many people will baulk at the suggestion of paying £40 for a T-shirt, but it's pretty decent value for a good looking, high quality item with technical performance. Those same people probably wouldn't think twice about paying more than that for a high-street brand without the performance or quality this tee offers. 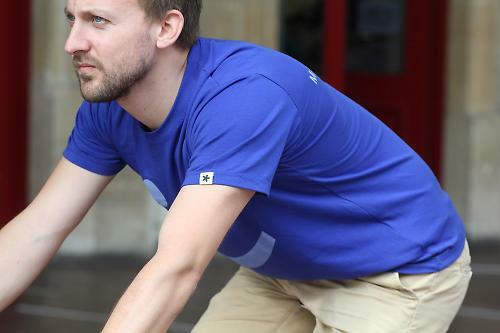 The Huez* Dri-Wink T is a simple T-shirt with added technical performance, aimed at commuters. Huez* says: "The Huez* Dri-Wink T-Shirt is the easy wear garment for the stylish commuter." A simple tee with a relaxed cut for wearing on the bike, made from a mixture of cotton, polyester and elastane. The fabric features dri-release technology, which helps wick away moisture, is fast drying and comfortable to ride in. A well made tee with nice attention to detail. After seven or eight washes the tee hasn't visibly degraded at all. A really comfortable tee to ride in. Really well. 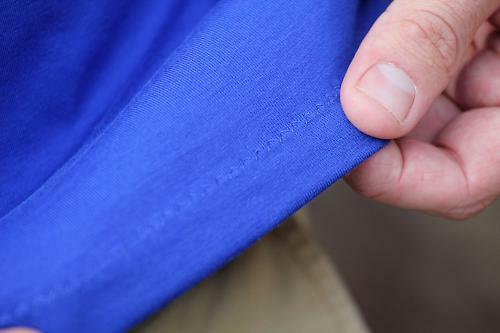 To look at it's just a normal tee but the dri-release fabric really helps in warmer weather. The style and the dri-release material. A really nice tee. Stylish, comfortable to wear on and off the bike, and the dri-release fabric really does make a difference. Are they having a laugh!